This high-performance HDMI/MHL 4K switcher is a wonderful multi-function unit by combining features of HDMI switcher, HDMI audio extractor, HDMI ARC audio converter and MHL input support into one unit at very competitive cost. Designed to extract the HDMI audio signal from HDMI input device or ARC (Audio Return Channel) enabled HDTV displays and convert it to digital S/PDIF audio or analogue 2-channel stereo audio for output to amplifier, receiver or speaker for presentation of original sonic quality. This HDMI ARC and digital audio extractor is perfect for use with those newer HDTV's with no dedicated audio outputs, allowing the connection of an HDTV with HDMI ARC output with analog amplifiers, AV receivers, headphone or active speakers. [Note]: When using the ARC function, please make sure that the CEC function of the TV Display is enabled and also use the standard HDMI 1.4 cable for the hookup. 1 of the HDMI inputs can even support MHL type input from mobile device. MHL to HDMI adapter cable is included in the package for convenience of direct hookup. This 5-input HDMI 4K switcher is a HDMI1.4 model and fully compliance with HDC1.4. Connects up to 5 HDMI source devices to a single HDMI input for transitions between gaming, television and more. This all-in-1 HDMI switcher and audio extractor supports all HD video inputs from 480i and up to 1080p and 4Kx2K UHD devices. 5.1CH Mode: Switch to 5.1 mode (Bitstream) for the HDMI source to output bitstream audio for compressed audio such as Dolby 5.1, DTS 5.1 channels or LPCM 5.1. 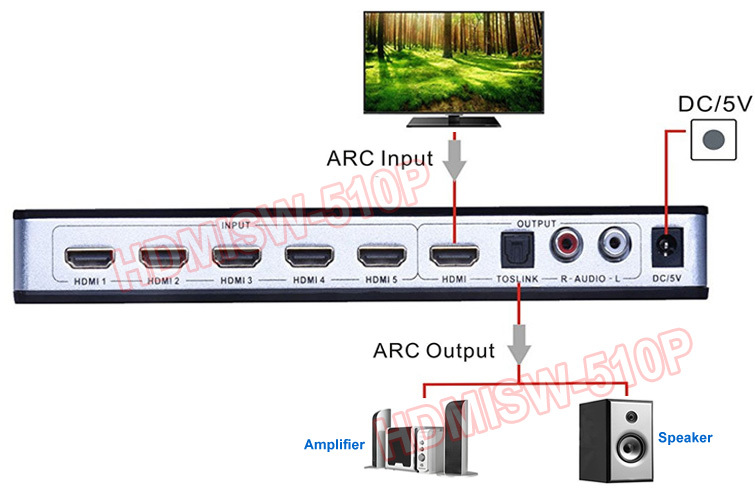 2CH Mode: Switch to PCM 2 channel mode for the HDMI source to output digital stereo audio for analog stereo output through RCA L/R connectors. Pass Mode: Switch to the pass-through mode for the HDMI source to output audio that the connected TV or AV receiver can handle. Max supports up to LPCM 7.1 channels. This HDMI audio converter can extract the digital audio embedded in HDMI feed such as Dolby Digital, AC3 and DTS 5.1 through its optical audio out. 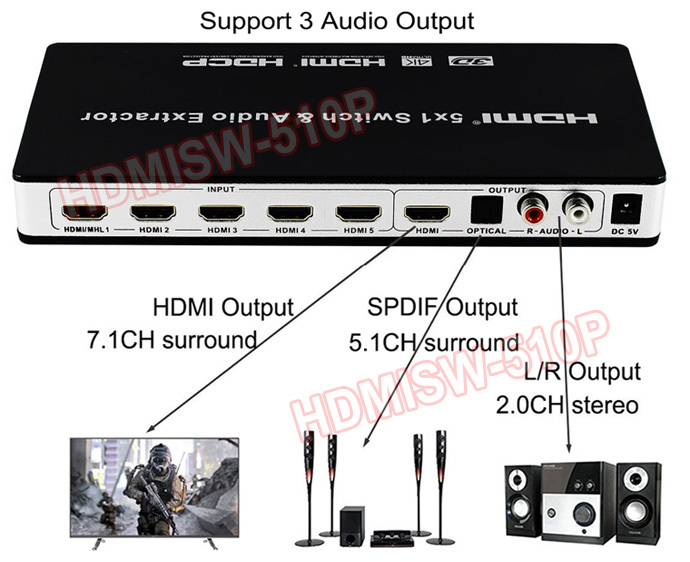 Its optical audio output support 5.1 channels of surround sound audio such as Dolby 5.1 or DTS 5.1 if the HDMI input feed has 5.1 channels embedded. This devices can extract the digital 2CH PCM stereo audio from the HDMI input and convert it into analog stereo through its RCA L/R output. Designed for helping those HDTVs with ARC (audio return channel) connected with existing analog audio receiver or amplifier with optical audio inputs or stereo L/R inputs. This unit can easily switch between various HDMI devices using its IR remote or the manual push buttons on the front of this HDMI switcher. Individual LED indicators available on the front panel for showing which HDMI input source user had selected and what audio mode being set for output. 3-In1 HDMI audio extractor converter switcher combines features of HDMI audio extractor, ARC audio converter, and MHL input support into one unit at very competitive cost. HDMI audio can be extracted through its optical audio output or stereo L/R output upon users selection and source device capability. Extract the audio signal from any ARC (Audio Return Channel) enabled HDTV displays and convert it to digital S/PDIF audio or line-level analogue stereo signal. Featured with ARC on/off button and ARC LED indicator light. Easy operation by the push buttons on the front panel or the IR remote controller for switching the desired HDMI input channel. Supports uncompressed audio such as LPCM 2-CH through RCA L/R or optical out. Supports compressed audio such as Dolby Digital, AC3 and DTS 5.1 through optical audio output. 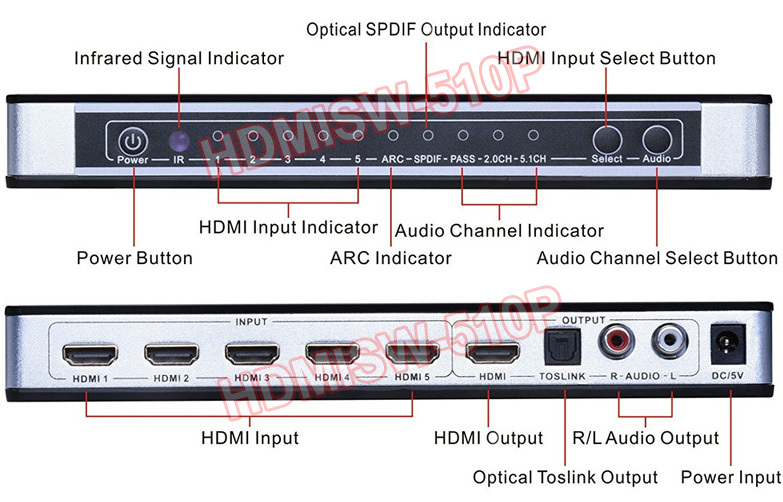 Supports HDMI V1.4, Ultra HD 4Kx2K/30Hz, HDCP pass-through. Supports 3D video and 12-bit Deep Color per channel. Supports compressed audio such as DTS Digital, Dolby Digital, DTS-HD,and Dolby TrueHD. Supports uncompressed audio such as LPCM 5.1 or PCM 2.1. Supports up to 7.1CH digital surround on HDMI output. Supports up to 5.1CH digital surround on Toslink output. Supports up to 2.0 channel analog stereo on Stereo output. Supports ARC (Audio Return Channel) extraction and CEC pass-through. Supports 3.0Gbps TMDS/300MHz pixel clock rate per channel. Individual LED status indicator for the selected HDMI or DVI input channel. Sleek and sturdy aluminum enclosure design.